Adobe and CyberLink software production companies have been around for decades, and during that time their products have been at the forefront of the change created by the emergence of technologies for the production of digital images. PowerDirector and Premiere Elements are both highly esteemed video editing programs that enable non-professional video editors to create stunning videos. In this article, we will try to help you to reach the decision which software is better for you, by comparing them and presenting you with the facts you will need to pick the software that is best suited for your editing demands. The price of a product always plays a part in the decision whether or not you should purchase it. CyberLink PowerDirector 16 Ultra and the Adobe Premiere Elements 15, come at the same price $99,99, while options that also contain the Adobe Photoshop Elements 15 are also available for a slightly higher price. The latest version of CyberLink PowerDirector's interface doesn't stray away from the traditional look and feel of the previous versions of the software, which means that video editors who have already used PowerDirector, won't have a tough time getting used to PowerDirector 16 Ultra. However, the abundance of video editing features can prove to be difficult for the software's users who are just learning how to use it. On the other hand, Adobe Premiere Elements 15 is designed to simplify the video editing process, and for that reason, even the users with absolutely no video editing experience can learn how to piece together video clips in this software. Furthermore, the Adobe's video editing program features a 'Guided' mode that provides detailed step-by-step explanations for all of the most important video editing actions. Adobe Premiere Elements is equipped with the 'Music Remix' feature that is designed to help you adjust the duration of your soundtrack songs and blend them together perfectly. The software also has a 'Soundtrack' track on the timeline, on which you can add voice narration you recorded with Premiere Elements 15 or any other sound files you want to include in your videos. Despite the solid editing features, Adobe Premiere Elements 15, doesn't offer a standalone audio editing software like CyberLink PowerDirector 16 Ultra. The Wave Editor program that is included in the PowerDirector 16 Ultra package enables its users to fine-tune the audio tracks of their videos in a professional manner. Furthermore, the PowerDirector 16 Ultra also features a lot of audio effects and allows you to edit audio files without switching to the Wave Editor. Both of these video editing programs have rich video effects libraries that serve as a valuable resource during the post-production process. In addition to over 30 video effects, Premiere Elements 15 also features the 'Applied Effects' tab that allows users to adjust the effects after applying them. Features like 'Haze Removal' or 'Film Effects' can be used to increase the visual standards of the footage processed in this software. CyberLink PowerDirector 16 Ultra is equipped with 'Lookup Tables' or 'LUTs' that significantly speed up the color correction process, while the TrueTheater Color feature automatically enhances videos and makes colors more vibrant. The software also enables its users to create stop-motion animations, apply transitions or manually adjust hue, brightness or saturation values. Innovation and improvement have always been the driving force and one of the guiding principles of the Adobe company, and Adobe Elements 15 is a great example. 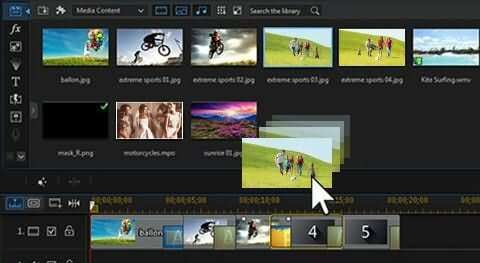 The 'Video Collage', 'Haze Removal' or Touch-base editing are only a few new features that improve the video editing experience in this software. What's more, the eLive Search option further increases the amount of support provided by the software's manufacturer. The 'Face Detection' and Pan-and-Zoom features are also among the new additions to the already long list of freshly added new features. Perhaps, the biggest change that the CyberLink PowerDirector 16 Ultra brings is the 'Video Stabilization' feature for 360-degree videos that enables the software's users to remove shakes from their 360-degree videos. Furthermore, the new version of the software also enables you to add titles to 360-degree videos, an option that can help you make your videos more accessible to a wider audience. TrueTheater Color, LUTs and Color Match features make the color correction process in PowerDirector 16 Ultra a fast and simple process, that takes significantly less time than it did on previous versions of the software. Why Should I Use Adobe Premiere Elements? If you would like to learn how to edit videos, then choosing a video editing software that can be there for you as your level of knowledge and skill increases is the best choice you can make. Adobe Premiere Elements 15 is a perfect tool for learning and developing your video editing skills because it provides support for nearly all editing actions a non-professional editor can ever need. The software is equipped with the latest editing tools the make editing fast, simple and easy. Why Should I Use CyberLink PowerDirector 16 Ultra? Do you want to produce amazing videos without wasting too much time in the post-production? If the answer is yes, then CyberLink PowerDirector 16 Ultra is the right choice for you. The Multi-Camera tool, a nearly limitless selection of video effects and superb audio editing possibilities provided by this software make it an excellent choice for all video editors who want to take their videos to another level. Keep in mind that the PowerDirector 16 Ultra isn't as easy to use as Premiere Elements 15 and that getting used to the software requires time and patience. Regardless of which of these two editing programs you opt to use, the editing options you will have on your hands will be sufficient to produce mesmerizing videos that will impress its viewers. Choosing the Adobe Premiere Elements 15 is a better option for video editors in need of support during the video editing process while opting for CyberLink PowerDirector 16 Ultra is better for users that need a larger pool of visual effects as well as better audio editing options. If neither CyberLink PowerDirector nor Premiere Elements is the best choice for you, you can try Wondershare Filmora, which is easy to use yet powerful enough to edit your video footage. Watch the video below to get more information about Filmora video editor.